Winter Triangle (red) and Winter Hexagon (blue). The Winter Triangle is an asterism formed by the three first magnitude stars Sirius in Canis Major, Procyon in Canis Minor, and Betelgeuse in Orion, and having roughly the shape of an equilateral triangle. 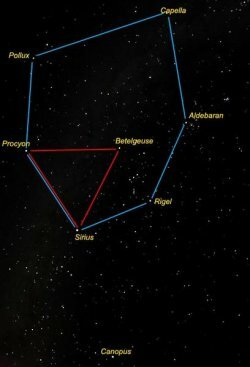 Two of the vertices of the Winter Triangle (Sirius and Procyon) are shared with the larger asterism known as the Winter Hexagon.